The leaders of North and South Korea will hold a historic summit in the Demilitarized Zone next month after Pyongyang expressed willingness to give up its nuclear weapons in exchange for security guarantees, Seoul said on Tuesday. 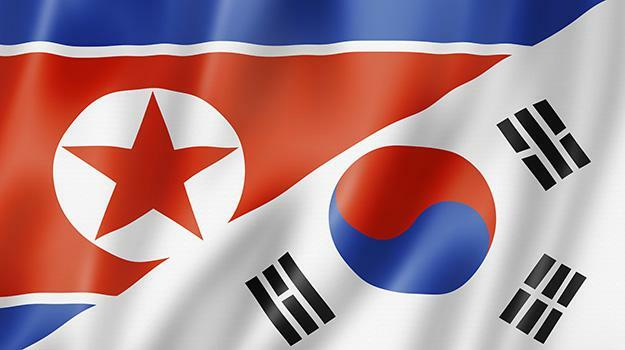 The North is open to "frank" talks with the United States on denuclearisation and would suspend missile and nuclear tests while dialogue was under way, the South's national security adviser Chung Eui-yong said after returning from a meeting in Pyongyang with leader Kim Jong Un. North Korea is subject to multiple rounds of UN Security Council sanctions over its atomic and ballistic missile programmes, and has long insisted that its "treasured sword" is not up for negotiation. But it is willing to abandon the programmes if its national security -- and that of its leadership -- is guaranteed, Chung said. That remains a high threshold -- Pyongyang has considered itself at risk of invasion by the United States since the Korean War ended in a ceasefire in 1953, leaving the two sides technically still at war. But, Chung said, Kim is willing to discuss denuclearisation in talks with Washington -- which could be the crucial concession needed to enable a dialogue to happen. The US has long insisted that Pyongyang take concrete steps towards denuclearisation as a precondition. Today's developments are the latest steps in a rapid Olympics-driven rapprochement on the peninsula. They follow a year of high tensions during which Pyongyang carried out its most powerful nuclear test to date, along with multiple missile launches, including rockets capable of reaching the US mainland. Kim and US President Donald Trump traded personal insults and threats of war, sending fears of conflict spiralling. But the Pyeongchang Winter Olympics in the South triggered an apparent transformation, with Kim sending his sister to the opening ceremony and sparking a flurry of cross-border trips as South Korean President Moon Jae-in tries to broker talks between Pyongyang and Washington. North and South agreed to hold a summit in late April in Panmunjom, the truce village in the DMZ, Chung said after leading the most senior delegation to travel North for more than a decade. It will be the third meeting between the leaders of North and South, but the first to take place in the DMZ after summits in Pyongyang in 2000 and 2007. The North "made clear that there is no reason to own nuclear (weapons) if military threats towards the North are cleared and the safety of its regime is guaranteed", Chung said. Pyongyang "expressed willingness to have frank dialogue with the US to discuss the denuclearisation issue and to normalise North-US relations," he added, and said there would be no provocations such as nuclear or ballistic missile tests while dialogue was under way. "Also, the North promised not to use atomic weapons or conventional weapons towards the South," he told reporters, adding that Seoul and Pyongyang would set up a hotline between the leaders. Previous negotiations have ultimately foundered.